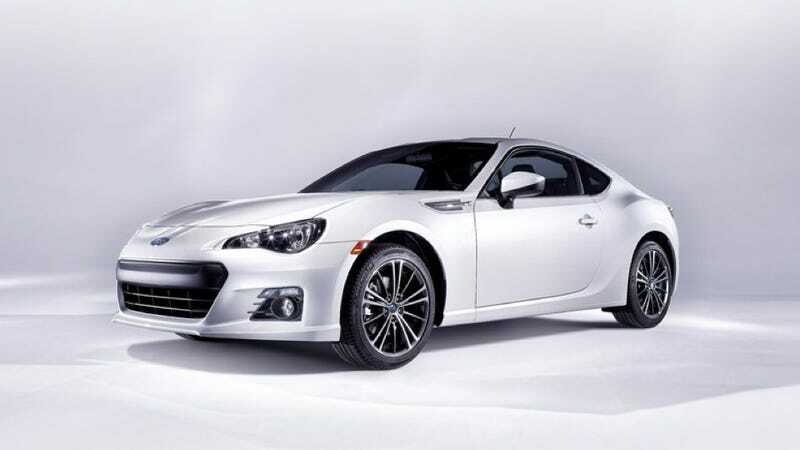 Here's the Subaru BRZ, the company's first attempt at a pure RWD sports car coupe. Based on the same platform as the Toyota GT 86 the Subieyota looks almost exactly the same as the Toyobaru. Though not quite as intense as the Subaru BRZ STI Concept we saw in LA, the production BRZ is definitely a major departure from the typical Subaru aesthetic. While there are some minor differences in the grille treatment and lower front fascia from the Toyota GT 86, it's largely in-line with what we've already seen. The big question surrounding the BRZ is whether or not it will get a more powerful version of the Toyota's approximately 197-hp boxer four. Sadly, Subaru doesn't give us an answer. Instead, their release for the new vehicle focuses on the vehicle's "Pure Handling Delight." This means a center of gravity close to the earth's magnetic core. As with the Toyota, the Subaru offers a choice of 6-speed automatic or manual transmission. You'll have to wait a little longer for new details. For now, enjoy the pre-Tokyo Motor Show photos.